What elicits more terror in the deep blue seas than a shark looking for its next meal? Sharks have been portrayed in movies and cartoons as dangerous marine animals that you should definitely keep your distance from. What people fail to see is how majestic they look midst all that blue without losing its fierceness. Underneath those razor sharp teeth is a great beauty they are willing to flaunt any time. 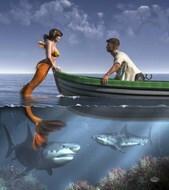 This is the purpose of shark art --- to capture this beauty either on canvass or on poster. This may add character to a space, especially if the characters you are going for are strength and fierceness like that of the shark. Just the mere presence of the shark’s image is enough to make the ambiance of the room scream. 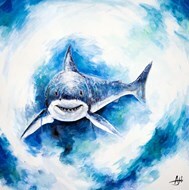 Shark art would find its perfect place in a modern-styled living room or office because of its color scheme which most of the time includes the blue to represent the shark’s habitat, grey for its body, and of course, white for its teeth. 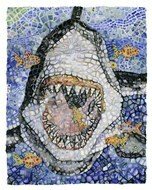 Shark art could be hung on your walls to remind you that there are times in your life when you need to be fierce and assertive, and that you must not let anyone push you around. 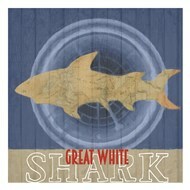 Choose shark art because not everyday could you see a shark underwater. It would be less scary and threatening to just have it on your wall. With this, you get to experience its beauty and majesty, minus the fear of being torn to pieces for lunch. 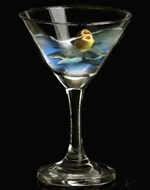 © ChefDecor.com. All rights reserved.